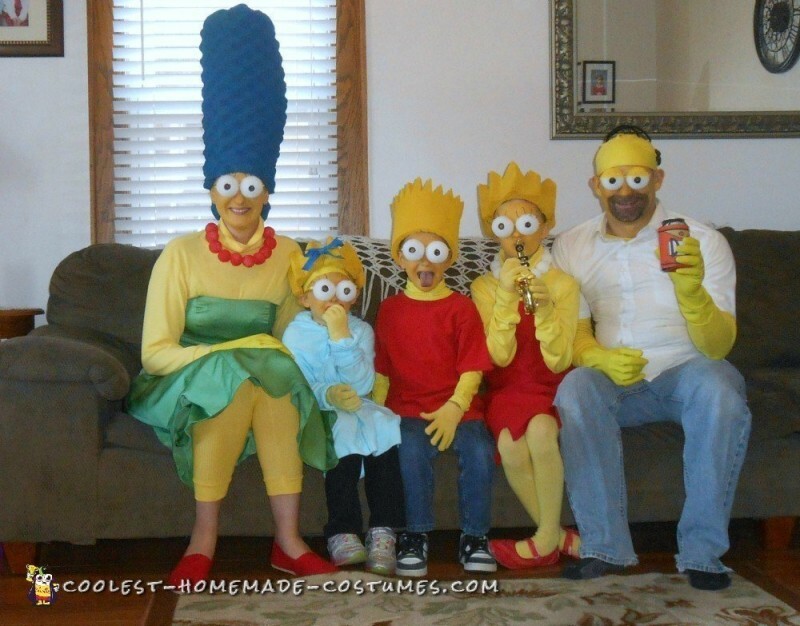 We love to do a theme or family costume each year and this year we went with Simpson costumes. 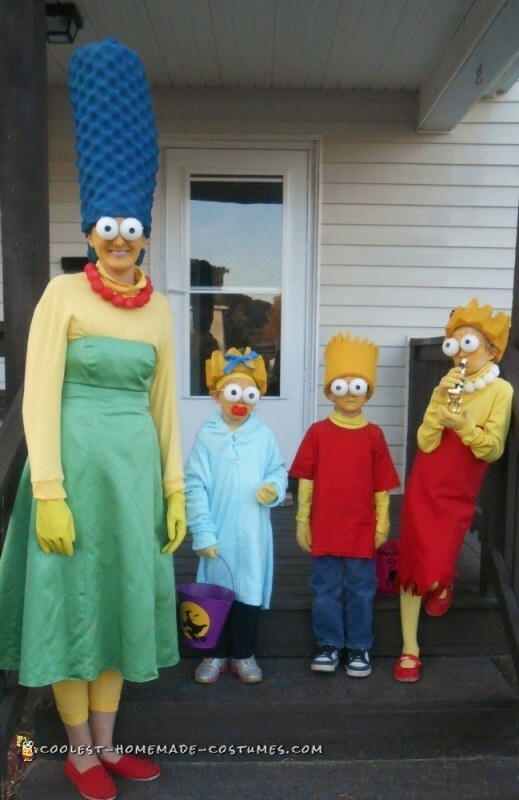 My son went through a stage of liking his hair spiked and that sparked our idea for these Simpsons Halloween costumes! I started with the hair and used the same egg foam crate for everyone’s hair (except bald Homer). I cut and sewed Marge’s to the appropriate shape and then spray painted it blue. For Lisa’s and Maggie’s, I used the same part of the egg foam (wavy part) and sewed it to fit their heads and then spray painted them yellow. For Bart’s hair, I used the backside of the foam crate to give a more smooth look, cut, sewed and then spay painted it as well. Homer’s hair is just a yellow swim cap with black pipe cleaners glued on. We tried a bald cap, but the swim cap worked better. The eyes are Dollar Tree frames with the lenses removed and a cut-in-half styrofoam ball glued on each lens. I punctured a round hole in each one so that we could see and then colored the hole black to look like a pupil. For the females, I inserted a wire for each eyelash which I then painted black. I put a dab of hot glue on the back of each eyelash for a cushion on the wire to make it comfortable while wearing. I gathered as much yellow as I could find (mostly from a second hand store) and then dyed the remainder of clothing that I needed yellow. I used Styrofoam balls again (size smaller than the eyes) for Marge’s and Lisa’s necklaces and strung them on the same wire that I made the eyelashes with and then spray painted Marge’s red. 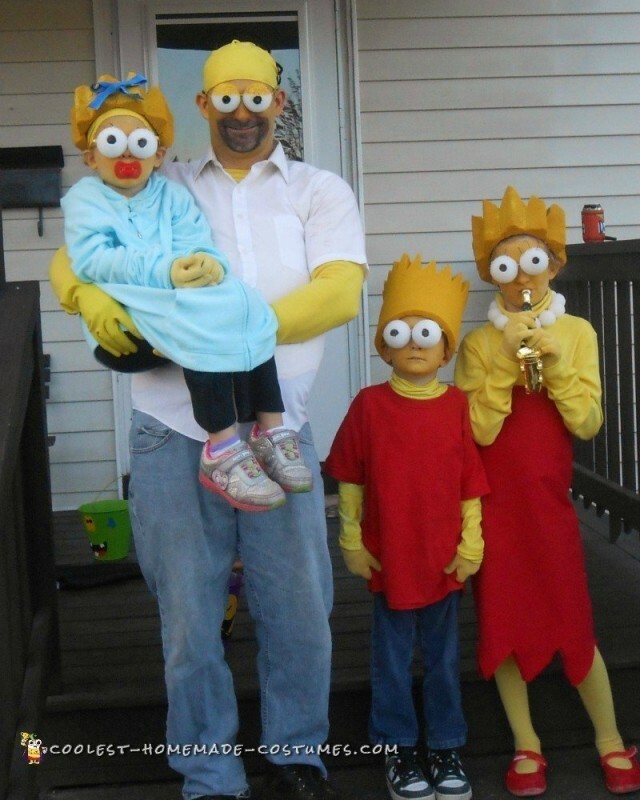 I ordered a little yellow face paint, a toy sax and a Duff beer can holder online and we transformed our family into “The Simpsons”. My kids had a blast. We’ve had a ton of positive reactions, like people stopping us for pictures. Someone even went around the block twice to get a look (they stopped to tell us). People stopped by our house to see us when we were outside taking pics on our porch. We have had a great time and made great memories! I started a good 6 weeks before we needed the costumes, but that was mostly gathering ideas and materials. Once I figured out how I was going to do everything I worked on it an hour or so here and there. Marge’s hair took me the longest with a good 2 hours in it between figuring the shape out, cutting and sewing, and spray painting. All in all I would estimate that I invested 6 hours in all 5 of them. I used mostly things we had to make the costumes. We had the egg foam crate, some of the clothes. Other clothes I needed, I bought at the local Goodwill. I had to buy the spray paint for around $4 each color ($8 total). I had some red, so I didn’t buy any for Marge’s necklace. I also bought yellow dye ($6), a swim cap ($2), a Duff Beer can holder ($6), toy sax ($)6, clothing/gloves that I didn’t have ($10), Marge’s shoes ($6), eyeglasses ($5 – $1 each), Styrofoam balls for eyes and necklaces ($7), wiring for eyelashes and necklaces ($2), pipe cleaners ($1). We bought 3 tubes of face paint so that we could wear our costumes a few times this Halloween season. Each tube was $5. I spent around $75 for 5 costumes.